As the child of a family running a busy village shop, the author developed the ability to be ‘a fly on the wall’ watching, listening and establishing lasting memories. 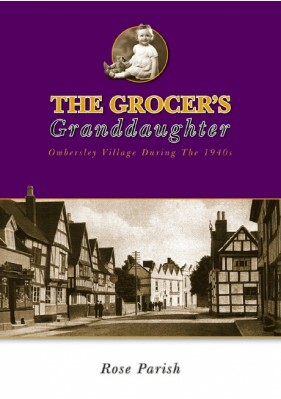 She has drawn up a very special picture of life in the Worcestershire village of Ombersley during the 1940s. This is a pithy account of village life as it was, offering a view decidedly unlike a picture-postcard image. The full stratum of village life is reflected, drawing attention to a variety of ideas and attitudes; poverty, wealth, a common work ethic, crime, tragedy, sorrow and pleasure are all there in the village mixing pot. Vivid accounts of school days under the eagle eye of a Dickensian Headmaster, together with tales of growing up in the countryside, are recounted. For her friends and herself, life was a ‘let’s pretend’ world of carefree childhood, playing around a lake and streams, enjoying the river bank and roving freely in lovely parkland, woods and meadows. Visitors to the village were always a source of interest and included Romany gypsies and American soldiers. The villagers knew how to enjoy themselves in a variety of ways including sporting activities, singing, dancing, and entertaining others. The author also recalls her Grandmother’s stories, which add another dimension to this book.